The oldest known existing recording is by Appalachian artists Clarence “Tom” Ashley (with Gwen Foster) who recorded it for Vocalion Records in 1934. Ashley said he had learned it from his grandfather, Enoch Ashley. Leadbelly recorded his version in 1943. The melody is a traditional English ballad, but the song became popular as an African-American Folk song. It was recorded by Texas Alexander in the 1920s, then by a number of other artists including Leadbelly, Woody Guthrie, Josh White and later Nina Simone. It was her version The Animals first heard. No one can claim rights to the song, meaning it can be recorded and sold royalty-free. Many bands recorded versions of this after it became a hit for The Animals. 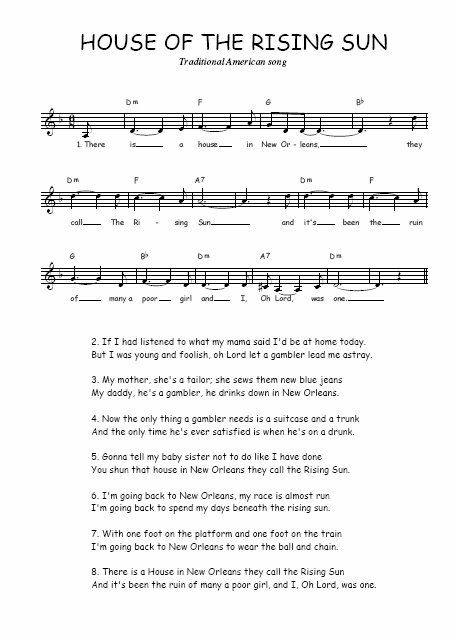 1) The song is about a brothel in New Orleans. “The House Of The Rising Sun” was named after Madame Marianne LeSoleil Levant (which means “Rising Sun” in French) and was open for business from 1862 (occupation by Union troops) until 1874, when it was closed due to complaints by neighbors. It was located at 826-830 St. Louis St.
It’s been the ruin of many a poor girl and me, O God, for one.If I had listened what Mama said, I’d be at home today. Was there ever really such a place in New Orleans that inspired the lyrics to this song? In the late 18th Century and most of the 19th Century, as well as today, prostitution and backroom gambling was illegal. It’s probable that places where these activities went on didn’t publicly advertise their trade. Did establishments such as these exist at that time in New Orleans? Without a doubt. New Orleans is a port city, located at the mouth of the Mississippi River, and merchants and sailors who were far away from home were constantly streaming in and out. In 1862, during the American Civil War, the Confederate Army in New Orleans surrendered the city and it fell into Union occupation, thus leaving many northern homesick soldiers in want of comfort and entertainment. In the history of New Orleans, there have been several business establishments that bore the name Rising Sun. Without help of public advertising of brothels or gambling houses, it is difficult to determine if the House of the Rising Sun existed, or perhaps as was the custom, this term was used as one of many euphemisms to describe houses conducting illicit business. There is a house located at number 826-830 St Louis Street in the French Quarter of New Orleans which is current owners claim is the famed, former House of the Rising Sun Brothel, originally run by a Madam named Marianne LeSoliel Levant (whose surname translates from French into ‘Rising Sun’), from 1862 through 1874. The owners, however, can offer no solid proof of this claim. There was a Rising Sun Hall in the 1890s, which served as a ‘benevolent association’ hall; it booked dances and rented rooms to musicians. These halls and clubs were the very birthplace of jazz. It is conceivable that prostitution and gambling occurred in the backrooms of these halls, with the constant transience of travelling musicians. This is purely speculation though, as no oral or written history exists about these goings-on. In the early 1800s there was The Rising Sun Hotel, located on Conti Street in the heart of the French Quarter. During its time of operation, the hotel was sold to new owners. In January 1821, an advertisement for the hotel in the Louisiana Gazette states the new owners will ‘maintain the character of giving the best entertainment, which this house has enjoyed for 20 years past. Gentlemen may here rely upon finding attentive Servants. The bar will be supplied with genuine good Liquors; and the Table, the fare will be of the best the market or the season will afford’. Although the advert does not prove that anything illicit was happening at The Rising Sun, it suggests it was a place where men went for a good time. In 1822, the hotel burned to the ground, and was never rebuilt. In 2005 this site was excavated by archaeologists in search of ancient Native American artefacts, and some interesting things were unearthed, making the former hotel ‘look impressively like a bordello’, according to Shannon Dawdy, the lead archaeologist. Dawdy cited finding combinations of broken pieces of ‘tons of liquor bottles’ and several rouge pots. I have made a study of the history of prostitution in New Orleans and have often confronted the perennial question, ‘Where is the House of the Rising Sun?’ without finding a satisfactory answer. Although it is generally assumed that the singer is referring to a brothel, there is actually nothing in the lyrics that indicate that the ‘house’ is a brothel. Many knowledgeable persons have conjectured that a better case can be made for either a gambling hall or a prison; however, to paraphrase Freud: sometimes lyrics are just lyrics.